One of the biggest complaints I hear from people about eating a real food diet is the price tag. I totally get it. It has take me a long time to figure out ways to be able to afford to eat the way that I want. And you can do it to. 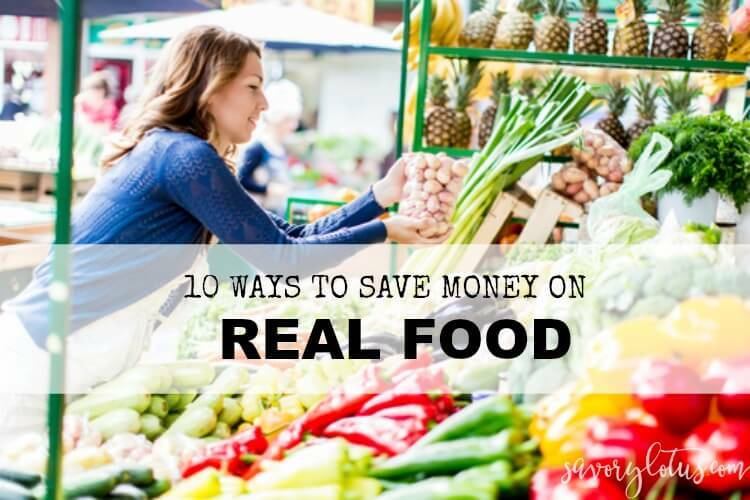 Here’s 10 of my favorite Ways to Save Money on Real Food. I’m a practical gal. I always have been. I like to be smart and efficient with everything that I do. But one thing that I have never been willing to compromise is the quality of the food that my family eats. What we put into our body matters. It matters a lot. And eating poor quality food will only cost us in the long run. I get a lot of comments about how expensive real food is and how hard it is to afford. I can totally relate as there have been times when money bas been tight in our family. And I can totally relate to the need to make the money stretch month after month. But I have found that making real food a priority has made affording it much easier. As a family, we give up other certain “luxuries” in order to be able to eat the food that we want. At this time, I drive an old car and do not have a car payment. I do not buy $5 coffee drinks, and buy my local, pastured eggs instead. I often buy my clothes used from a local consignment shop and love going to clothing swaps. I do the same for my little one. We have several used children’s clothing stores and welcome hand-me-downs from older friends. And we live a simple lifestyle. We don’t put value on expensive furniture and other such luxuries. (who else loves thrift stores?) I have found that living a more minimalist lifestyle is very liberating. Less to worry about. And the biggest thing is that we have learned to eat very simply. Protein and vegetables. That’s about it. We do’t eat fancy, gourmet meals. See #5 below to see my super simple trick to creating variety with real food. Going to the grocery store multiple times a week can be hard on the food budget as we will inevitably buy extras that are not “on the list.” I find that if I make a firm list and limit my food shopping to once per week, I am able to stay more within my budget. 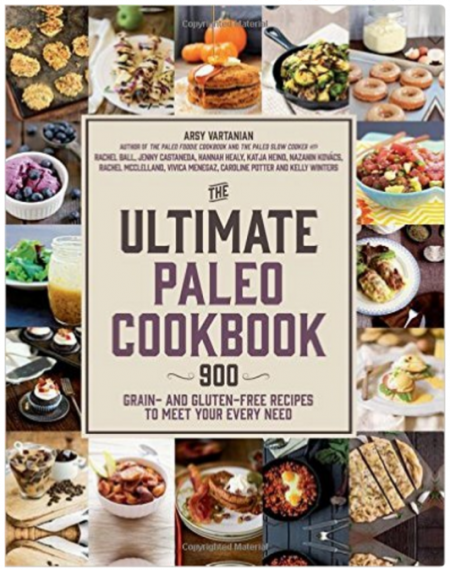 Amazon has so many great deals on many of the food staples that we eat. I often get bulk sizes of almond flour, coconut flour, coconut butter, BPA-free coconut milk, and even baking supplies. I try to make large orders to keep my pantry stocked so I shop less often. I love Vitacost. Skip the lines and expensive prices at the health food store and order your kitchen staples, household cleaners, personal care products, and supplements delivered right to your front door. 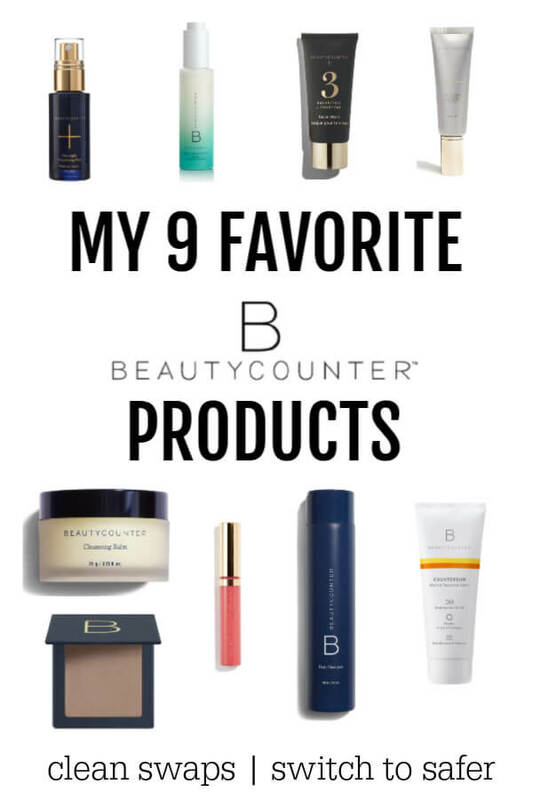 I save an average of 20-40% on products that I would normally throw in my shopping cart at the store. I try to make a big purchase of things like dish soap, laundry soap, sponges, supplements, pantry staples, and snacks so I am stocked up for a while. Like I mentioned before, shopping less saves me money. Checkout Vitacost HERE. All I can say is the Tropical Traditions has the best coconut oil EVER. I buy a couple 1 gallon tubs of the Gold Label Virgin Coconut Oil. This lats me quite a while, and you can often find buy one get one free specials on the site. You can also purchase good quality grass fed and pastured meats through them. Thrive Market is essentially a real food buying club that saves you 25-50% off on your favorite healthy brands. You can purchase things like real food staples, non-toxic household cleaners, supplements, and toiletries, and it all gets delivered right to your front door. I love that they give you 15% off of your first order, and shipping is free on orders over $49. No, I am not going vegetarian on you here. But filling your belly with fresh, local, seasonal vegetables is a great way to save money. Seasonal vegetables are more affordable than imported produce and can be found easily at your local farmer’s market for a good price. But remember that in order to absorb all those juicy nutrients from your veggies, you have to add a bit of fat. Read why I say no to skinny veggies HERE. Oh how I love my eggs and bacon for breakfast. But doubling up on protein can really make the food bill skyrocket. In order to save money, we try to just serve one protein item per meal. Try to feature your bacon, eggs, chicken, beef, or cheese separately. Eliminating packaged, processed foods from your list can do wonders for your grocery bill and your health. Learning to prepare your family staples from scratch will not only help you avoid hidden unhealthy ingredients, but will save you money as well. I make 5 liters of homemade sauerkraut for the same price as one jar from the health food store. The homemade bone broth that I make almost weekly is incredibly inexpensive and adds invaluable nutrients to our diets. Making your own salad dressings, mayonnaise, and other condiments can help cut corners as well. I have often said that the trick to making real food interesting is having lots of condiments around to spice things up and to create variety. I have found that developing a rhythm around the things that I make from scratch makes it much easier. I often cook a whole chicken on Sundays and start my broth on Monday. When we are low on condiments, I spend a Saturday morning or weekday evening preparing a few that will last us for the next couple of weeks. We get a box of organic vegetables every week for a local farm. Joining a CSA (community supported agriculture) is a great way to save money on healthy food. You get freshly picked produce that will last days longer than the produce that has be sitting for days or weeks at the grocery store for a much lower price. Also, don’t forget to visit your local farmer’s market. You will find the best deals on the freshest, seasonal produce. And did you know that you can get some of the best deals if you arrive at the end of the day? Many farmer’s will give discounted prices on leftover produce so they don’t have to haul it back home. Buying local, seasonal fruits and vegetables not only saves you money, it also ensures that you a will waste less food as it lasts a lots longer. One of the biggest food expenses that I have is properly sourced meats, but once you know how commercial factory-farmed meats are produced, there is no going back. The way that I save money is buying my meat in bulk. Making a once a year purchase for grass fed beef and pasture-raised poultry can save you big bucks on good meat. I was amazed how much money I saved buying a 40 pound block of local, organic, grass fed butter. (Did you know that butter freezes well?) Investing in a chest freezer will more than pay for itself in savings. Simply pull out what you are going to eat for dinner in the morning and add some of those awesome vegetables that you have and dinner is ready in a snap. I have 3 main local places that I shop for my food basics, and each place has the best prices on certain things. I pick one day to do my food shopping and hit 2-3 places to get the best prices on the things that I need. Not only can growing your own food save you money, it connects us to where out food comes from as well. I am a super busy mama, and having a huge home garden is not possible for me right now. But I can easily save money by growing my own kale and chard (staples in our kitchen) and fresh herbs like oregano, basil, cilantro, rosemary, and thyme. We have several fruit trees (apples, pears, cherries, figs, and pomegranates) and enjoy an abundance of seasonal fruits during the year. We planted raspberries, mulberries, loganberries, and blackberries a few years ago that are now giving us copious amounts of fresh berries in the summer. We also plant a few tomato plants and some zucchinis in the summer. It doesn’t have to be a huge things. Everything helps. Getting organized around what we eat has been a big help in saving money on real food. I spend just a bit of time planning out our meals for the week before I make my grocery list. I already have my staples ordered online and in the freezer, so mostly I am shopping for fresh produce. When you know what you are going to eat for the next week, you can buy only those things that you need and will waste much less food. Meal planning can take a bit of getting used to. I often pour thorough my favorite cookbooks or favorite blogs for inspiration. We also have family favorites that I rotate through. It gets easier the more you do it. You will find family favorites that can be repeated again and again. Bonus Tip: When you are meal planning and doing your shopping, plan on making a double batch of whatever you are making. Freeze the extra for a quick and easy meal on a busy week night. OK, now it’s your turn. 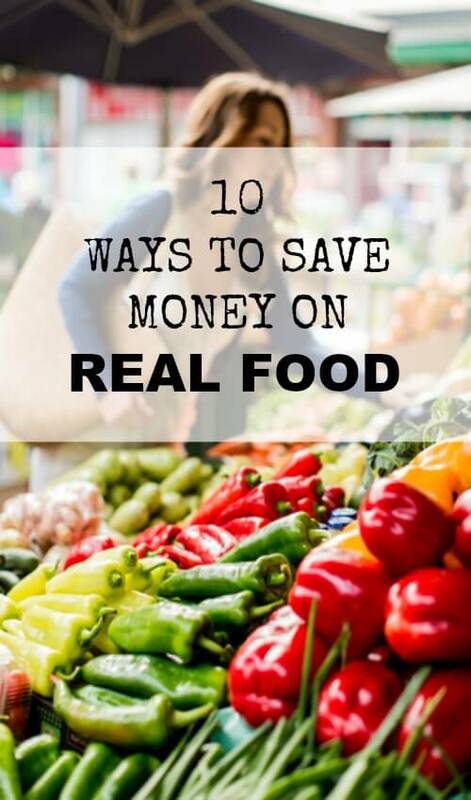 What are you your favorite tricks to saving money on real food? Hi-I live in Sebastopol also-just wondering where you get your local, grassfed butter? Would love to buy some of this! I am a Holistic Nutrition and Life Coach and I appreciate your list of ways to save money on real food! I have one to add – it’s Grocery Outlet. For years I drove by them in various towns, turning down my nose. I am very finicky about quality and prefer to buy only organic or beyond organic ingredients and very little processed food from independent grocers or growers. Here is what I learned – Grocery Outlets are family owned and independently operated. The foods they stock vary because they are often buying close out product, so you never know what they may have in the store, and you have to read expiration dates. That said, I now routinely purchase organic fruit, vegetables, meat and dry goods at 50% discount. I have been saving so much money. Finding ground lamb or buffalo, or organic chicken, I buy extra and throw it in the freezer. Now I am shopping less frequently, so it’s also a great time saver!